It was a momentous month: May 1993. "We will never the see the like again," declared the Nottingham Forest matchday programme, as Brian Clough retired from football management after 18 years in charge of the Reds. 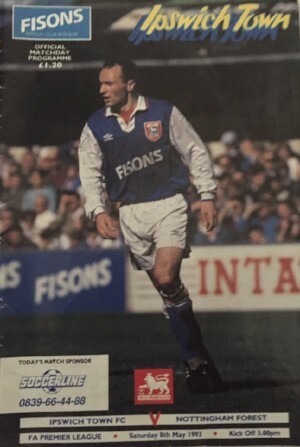 His final home league game was against Sheffield United on 1st May, 1993. It was an emotional afternoon as he said farewell to the fans who, after the final whistle, surrounded him on the pitch to show how much he meant to them. Following an outstanding managerial career in which he lifted countless trophies, including two league titles and two successive European Cups, his fans showed their appreciation for the years of enjoyment he had brought them. Even the United fans sang his name (receiving the famous thumbs-up in return) and although the Reds lost the match 2-0, marking their relegation from the Premiership, the Great Man's achievements could not be overlooked - and his fans were determined to show their love and gratitude. 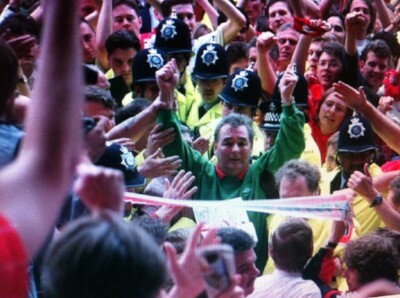 A policeman on duty at the City Ground that day remembers being on the pitch with Brian as supporters surrounded him. Said Brendan Hunt: "I recall pushing through the crowd, who were making towards Brian, and with two or three other officers formed a Police cordon around him, to offer him some protection from the crowd who were simply mobbing him. He looked tired and almost beaten, and perhaps a little overwhelmed. I said to him, 'Are you alright Brian?' and he replied, 'Oh yes, young man!' and he continued to conduct his pitch farewell. Brendan's memories are among the many included (from Brian's friends, family and fans) in the book 'The Day I Met Brian Clough'. Cloughie's programme notes that day concluded: "Be good ... and thanks for having me." There are more memories in a Daily Mail report reflecting on that emotional day. 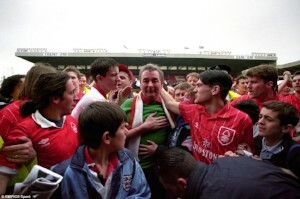 Cloughie's final league match came a week later, away at Ipswich, where fans gave him a standing ovation. In typical style, just minutes before kick-off, Clough gave a hug and a kiss to Ipswich's young James Scowcroft - a moment James still remembers fondly. The General Manager of Ipswich, John Lyall, presented his old friend with an inscribed silver salver to mark his amazing achievements. 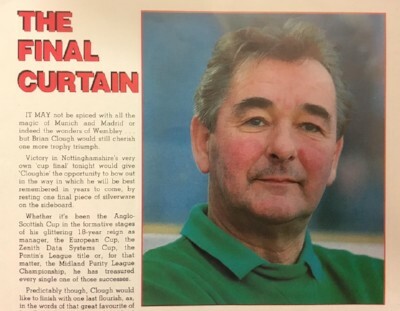 In the matchday programme, Ipswich boss Mick McGiven paid tribute to Clough, who he had seen as a "great goal-scorer" in the north-east many years earlier. He said Brian had contributed so much to football. Ipswich chairman John Kerr wished Cloughie a long and happy retirement. He said: "Not only has he been such a great character in the game who has brought colour to football when it has needed it most, but over so many years his teams have entertained and played the type of football which supporters have enjoyed." Forest lost the match 2-1, with Brian's son Nigel scoring for the Reds. Thanks to Chris Schofield who attended the game and sent the photo of the programme cover (opposite). 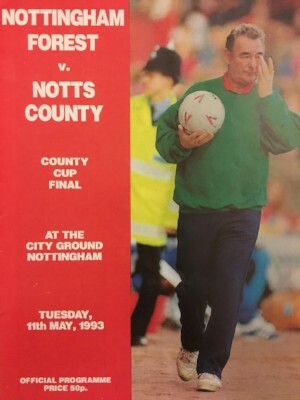 Cloughie's final first team match was the County Cup Final against Notts County on 11th May, 1993. Fittingly, it meant the Master Manager could put one final piece of silverware in the trophy cabinet. The programme described it as 'The Final Curtain' - and it ended in a 3-0 win for Cloughie's Reds. The match is included in the best-selling Clough book 'Brian Clough Fifty Defining Fixtures' which includes great quotes and details from the archives. You can buy personalised copies, with a special discount price, HERE. Cloughie said he looked forward to retirement, being with his grandchildren and admiring the flowers in the garden. The Master Manager had stepped down, but the legend lives on.